Some dogs have amazing talents. We have seen some that actually know how to surf. Others can skateboard. Some dogs are used for therapy and some can even use a toilet. Your dog? He's an actor, naturally! And guess what? Little Sparky is more than ready to make his debut in your costume remake of The Wizard of Oz. Now, you might have picked him to play Toto, but he said that dressing up as the legendary Tin Man was a role that felt more “challenging” for him as an actor. Fair enough. 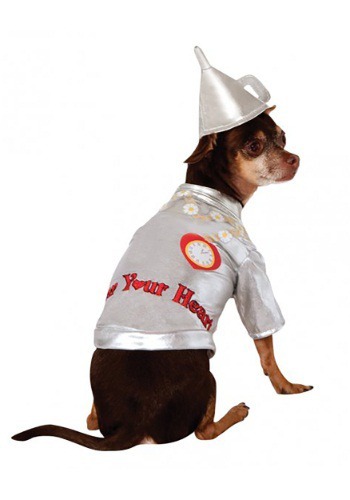 This Tin Man Dog Costume allows him to get fully into character in a way that perfectly fits his little pooch frame. It comes with a shirt and a hat, so he can team up with you and the Scarecrow and the Lion and ease on down the yellow brick road in style. His success rests on this look. The critics are already questioning his ability to play such a demanding role so opposite his true nature; he is, in fact, all heart!